There are currently no Anacostia notable alumni listed. Be the first to add an AHS famous alumni. If you know someone who graduated from AHS in Washington, DC that has passed away, you can create a memorial for them. There are currently no memorials for Anacostia alumni. 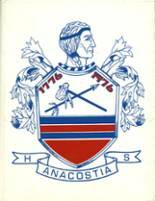 This site has been created for the former students of Anacostia located in Washington, District of Columbia. If you are a Anacostia alumn, we encourage you to register and be sure to sign up for the alumni newsletter. We also encourage you to keep up to date on news and reconnect with Anacostia High School alumni. Boring Cathy has someone searching for them. Tamara Baxter has someone searching for them. Constance Howe has someone searching for them. Shirlene Eatmon has someone searching for them. Mary White registered as a AHS Class of 1959 alumni. Mary White updated her profile picture. Mary White added photos to their personal photo gallery. Mike Anacostia Jones requested a AHS yearbook from 1986. Mike Anacostia Jones registered as a AHS Class of 1986 alumni. Adam Scott Iii updated his profile picture. Adam Scott Iii registered as a AHS Class of 1969 alumni. Adam Scott Iii added photos to their personal photo gallery. Ted Cogdell updated their profile picture. Ted Cogdell registered as a AHS alumni. Ted Cogdell added photos to their personal photo gallery. Kay Gregory Poulsen registered as a AHS Class of 1958 alumni. Kay Gregory Poulsen added photos to their personal photo gallery. Kay Gregory Poulsen updated her profile picture. Sharnita Jones added photos to their personal photo gallery. Sharnita Jones requested a AHS yearbook from 1989. Sharnita Jones registered as a AHS Class of 1989 alumni.